Down filled accent pillows are an easy, inexpensive way to take a room from plain nice to a breath taking, warm and inviting living space. Shop online for an endless selection of sizes, fabrics, and prints. Even try your hand at making your own. When shopping you may notice that accent pillows are also called: throw pillows, toss pillows,decorative pillows, and cushions. They all mean the same thing –decorative pillows – to add color, style and comfort to your home. Add a rug, a throw blanket, and a few lamps with your cushions to give your room a sense of depth and a polished look. the beds, of course. Don't	forget the guest room. Don't get in the habit of sleeping on them	because they are not covered in an easy to wash pillow cover. sofas and chairs. They will	come in handy for naps and provide extra lower back support when	sitting. the floor for a cozy, shabby	chic look, or in the TV or kids room. porch and sun room furniture. A room is boring to look at when everything is the same and matches because everything blends in with everything else. Fabrics Mixing	fabric is a good thing and very much in style. Textured fabrics	like corduroy look great against the smoothness of a fabric like	silk or micro suede. 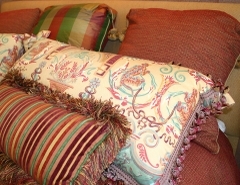 Colors and	Patterns Down filled	accent pillows are a great way to add a splash of color to an	otherwise neutral decor. 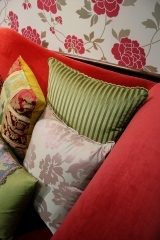 Choosing cushions the same color as other	accent pieces (vase, painting, lamp, etc) in a room will make them	pop. Mixing patterns like stripes and florals is OK too, as long as	they don't seem to be competing with one another. Shapes &	Sizes A variety of cushion	shape and sizes will add depth and create a great look. Add a	novelty accent pillows (like sports balls, hearts, flowers, etc.) to add fun and liveliness to a room. You've never had a natural knack for decorating and totally confused about prints, fabrics, and colors to best fit with your home and style? First and foremost go with what pleases you. Try to notice what grabs your attention when you walk into a room. Take an extra minute to touch and feel different textures. Certainly some will look and feel pleasing, while others make you cringe. If putting it all together is the scary part for you it's time to go window shopping at furniture show rooms. If leaving the house isn't in your plans do a Google image search for “home furnishing”. Also browse catalogs & magazines. Take notes about what you like. What looked good with what. Note the shape, size, color, fabrics and destination. When you've found a look that you like shop online to recreate the look for a fraction of the price. Return from this Down Filled Accent Pillows page to the Down Bedding Delights home page.